The question appears on the surface to be an easy one to answer. 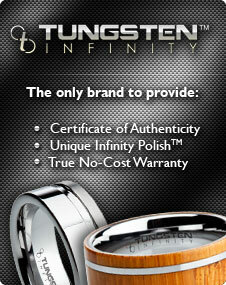 Clearly, a tungsten ring is a ring produced from the metal, tungsten. If only life was that simple, we would all be able to pack up and retire to our favorite beach. There is a little more to it that merely being a ring made of tungsten, but what exactly is a tungsten ring? Well, the first thing to get out of the way is that a tungsten ring is not actually a tungsten ring at all. Tungsten carbide is an alloy of tungsten, created when tungsten is combined with another metal, in the case of high quality rings, this will be carbon, at high temperatures. This creates an even stronger substance than tungsten alone, and is perfect for those who need a hardwearing and durable ring. Tungsten carbide is the hardest metal in the world, and as such requires much less maintenance than the traditional metals used for ring production, such as silver and gold. In fact, tungsten carbide is so durable that only diamond is known to be able to scratch it. Another feature of tungsten carbide is its natural, shiny finish, meaning that it never needs to be polished to the extent that a gold or silver ring may need to be. In addition to the features already detailed, tungsten carbide rings can also be laser engraved with a personalized message, or even a pattern of some description. Traditional etching can damage and weaken the ring, and can leave a poor looking finish. Tungsten carbide rings are quickly emerging as the essential accessory of the 21st century, perfect as an engagement ring, a wedding band, a gift, or a personal fashion purchase. If you have not yet been out and bought one, what are you waiting for? ary� i@�H@Mtailers websites. However, by knowing that a difference does exist, you are set up to ensure you do not unwittingly purchase a weaker, lower quality ring.